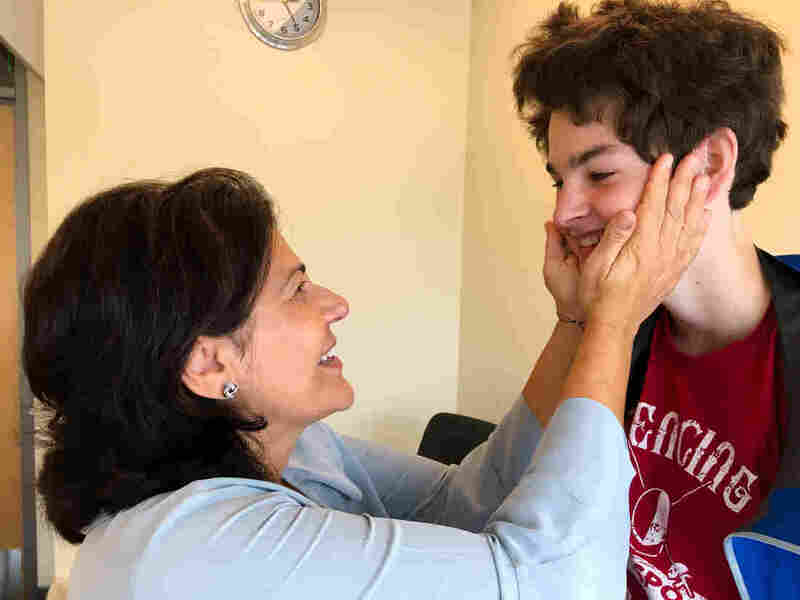 A Marijuana-Based Medication Prevents Seizures For Some Epilepsy Patients : Shots - Health News Sam Vogelstein used to suffer a hundred seizures a day. Then he tried a marijuana-based drug that wasn't available in the U.S. It stopped his seizures and has just been approved by the FDA. 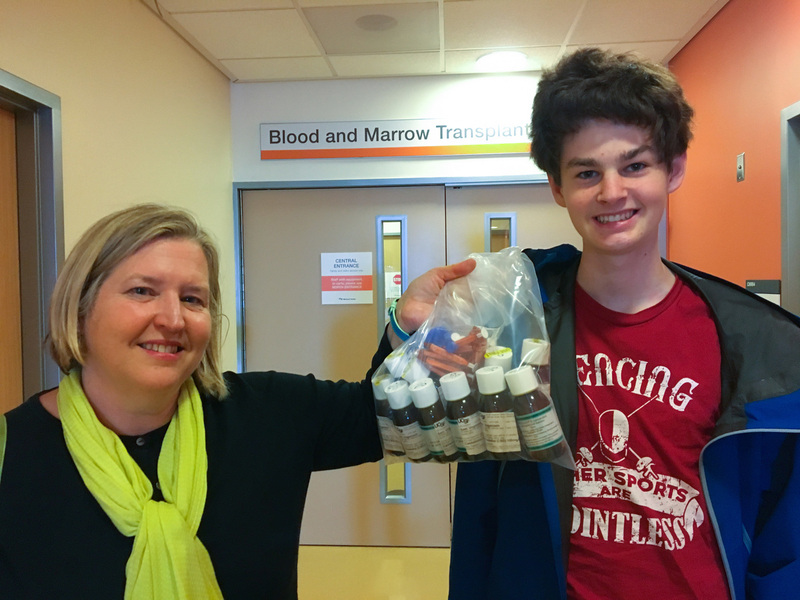 Evelyn Nussembaum and her son Sam Vogelstein pick up a six month supply of Epidiolex from the experimental pharmacy at UCSF. The first prescription medication extracted from the marijuana plant is poised to land on pharmacists' shelves this fall. Epidiolex, made from purified cannabidiol, or CBD, a compound found in the cannabis plant, is approved for two rare types of epilepsy. Its journey to market was driven forward by one family's quest to find a treatment for their son's epilepsy. Scientific and public interest in CBD had been percolating for several years before the Food and Drug Administration finally approved Epidiolex in June. But CBD — which doesn't cause the mind-altering high that comes from THC, the primary psychoactive component of marijuana — was hard to study, because of tight restrictions on using cannabis in research. Sam Vogelstein's family and his doctors found ways to work around those restrictions in their fight to control his seizures. Sam's seizures started in 2005 when he was four years old. It's a moment his mother, Evelyn Nussenbaum, will never forget. The family was saying goodbye to a dinner guest when Sam's face suddenly slackened and he fell forward at the waist. "He did something that looked like a judo bow after a match," says Nussenbaum. Two months passed before Sam had another seizure, but then he started having them every week. Eventually he was suffering through 100 seizures a day. "When they were bad, they were once every three minutes," Nussenbaum says. Sam was diagnosed with epilepsy with myoclonic-absences, which is characterized by an abrupt unresponsiveness and then sudden body jerks. The episodes were quick, but dangerous. Dr. Roberta Cilio, neurologist at UCSF, proudly tells her patient Sam Vogelstein he is cleared to drive a car. The electricity in Sam's brain would misfire for about five to 20 seconds, enough time to fall down stairs, plunge face first into a dinner plate, or crack his head on a window. "I don't remember a lot of it really," says Sam. He does remember the barrage of medications his doctors put him on. Some helped briefly. Others triggered hallucinations, full body rashes and uncontrolled anger. "Sam is a pretty gentle person, " his mother says. "We put him on one medication and it made him angry, and he started punching kids. And it was like, 'Oh my God, this is not my kid.' "
More than 3.4 million Americans have epilepsy, according to the Centers for Disease Control and Prevention, but treating the disease is often a riddle doctors find difficult to solve. Sam struggled to read, to write, to solve math problems and Nussenbaum watched her son fall further and further behind in school. Life for Sam was like a bad cell phone connection: Every few moments the signal dropped out. "It was scary," Nussenbaum says. "I would often cry in my shower or I would drive up to the top of Grizzly Peak [in Berkeley] and sit in my car and scream." In 2011, Nussenbaum came across an article in a British medical journal about a small seizure study on rats. The researchers successfully treated the rodents with CBD. "I thought, 'My son needs access to that,' " says Nussenbaum. But, seven years ago, pure CBD was not easy to get. Many states have since legalized medical marijuana and CBD is widely available at dispensaries and on the internet, but it is still classified as a Schedule 1 drug by the U.S. Drug Enforcement Administration which means it's illegal under federal law. Then, Nussenbaum learned about a British pharmaceutical company – GW Pharmaceuticals — that was making a medicine derived from highly-concentrated CBD to treat multiple sclerosis patients. After months of phone calls and emails from Sam's parents, the company agreed to let Sam try the drug, in the U.K., under a doctor's supervision for two weeks. The family flew to London shortly after. "After one day his seizures were down to 30," says Nussenbaum. "After two days they were down to ten. After three days he had one seizure." Sam didn't suffer any side effects. Back in the U.S. Sam's parents needed to find a way to keep getting the drug. They collaborated with Dr. Roberta Cilio, a neurologist at the University of California, San Francisco. They petitioned the FDA to allow Sam to use the drug under a compassionate use program. Four months and hundreds of pages of documents later, the FDA allowed Sam to enroll in his own one-person trial at UCSF. The DEA was a little more cautious. One day two agents knocked on Cilio's office door. After hours of questioning, the two men requested she store the medication in a giant safe weighing close to 1,000 pounds. According to GW Pharmaceuticals, Sam was the first patient in the world to receive Epidiolex. Inspired by Sam's success, Cilio, and other clinicians, started trying Epidiolex on other patients. In 2015, she and several co-authors published a study in Lancet Neurology that included 214 patients with treatment-resistant epilepsy, all children and young adults. For most patients the results were not as dramatic as they had been for Sam. Seizures dropped in 36.5 percent of patients, which is about the same success rate as other seizure medications, Cilio says. And some patients experienced side effects like fatigue, diarrhea and convulsions. Cilio doesn't know why CBD transforms some lives and other patients don't respond at all. "The studies that are out are mostly short term," says Cilio. "We need to learn who the best responders are. Of course, we know this is not a miracle drug." There have been other trials of CBD oil for epilepsy, which have shown that the substance is helpful for a portion of patients. Several states have legalized CBD oil specifically for the treatment of intractable epilepsy or seizure disorders. And as NPR has reported, CBD has gained popularity with consumers as a remedy for a variety of other ailments. But the products that are available over the counter or in medical cannabis dispensaries, aren't regulated the way pharmaceutical drugs are, so the consistency and dose can vary widely. The FDA's decision to approve Epidiolex means that epilepsy patients will have access to a pharmaceutical-grade drug, which delivers a high-quality, consistent dose of CBD, says Dr. Robert Carson a pediatric neurologist at Vanderbilt University who treats patients with epilepsy. Epidiolex still has to get over one regulatory hurdle. The DEA needs to reclassify CBD so it is no longer considered a Schedule 1 substance. Drugs in this category are considered to have no medical use and a high potential for abuse. The FDA's approval of Epidiolex means CBD no longer fits that category and the reclassification is expected some time in the fall. Patients will need a prescription to get the drug. GW Pharmaceuticals has not released a price yet. And Sam's mom, Evelyn Nussenbaum worries that some insurance companies might not cover it. In the meantime, Sam still gets his drugs from the investigational pharmacy at UCSF. One day he hopes he'll be prescribing the medication to patients like him. "I want to be an epilepsy doctor," Sam says. First he's working on his driving license. Dr. Cilio just cleared Sam to get behind the wheel. He's 17 now and hasn't had a seizure in more than two years.